theclient’s head at the final fitting. 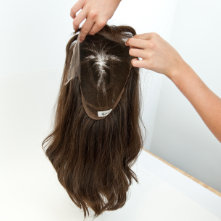 At Amiwigs we produce beautiful bespoke human hair wigs that feel and move like naturally growing hair. 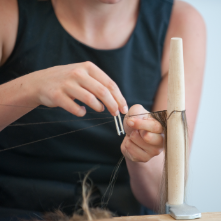 All our bespoke human hair wigs and hairpieces are custom made and cut on the client’s head at the final fitting. All are made using the highest quality European human hair, which ensures the most natural colour and texture match and movement. Unless of course you are not of European decent, in which case we will order in hair to match that of your origin, so not only the colour and texture is identical. 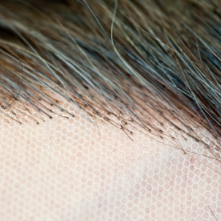 On the initial consultation, which is free of charge, we will gain an understanding of what hair loss our customer is suffering from. We take time to explain how we make the bespoke human hair wigs and hairpieces and show the materials used and what options we have to offer. Then a head shape and measurements are taken to ensure an exact fit. We also take a number of hair samples to ensure an exact colour match, unless the wig or hairpiece is intended to be a chosen colour, from which you can choose from our colour wheel. Dependent on our customer’s availability and requirements a number of fittings may be required. All bespoke human hair wigs and hairpieces are made within 4-6 weeks of ordering. All our wigs and hairpieces are handmade in the UK. Amiwigs also offers an advice service. 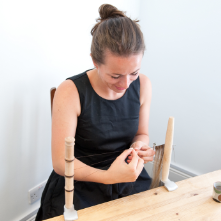 …so please get in touch if there is anything you feel we may be able to advise you upon. Please read some of our reviews from existing customers.